1. Council acknowledges we are in a state of climate emergency that requires urgent action by all levels of government, including local Councils. 2. Councillors receive a briefing from officers on how to best act on the ‘climate emergency’ acknowledgement and ensure this is embedded into future strategies and the next council action plan. 3. Council updates the Zero Carbon Evolution 2040 framework to embed the ‘climate emergency’ acknowledgement. The motion at Moreland Council calls for councillors to receive a briefing from officers on how to best act on the climate emergency acknowledgement. Consideration of the climate emergency will also be embedded into future strategies and the next council action plan, as well as updating the municipality’s Zero Carbon Evolution 2040 framework to embed the climate emergency acknowledgement. Cr Dale Martin: “Yep, so firstly I’d like to just really acknowledge the work that our counterparts over in Darebin have done in this space. They are really trailblazers in this area and in recognising this as a really important issue and really allowing us to learn from them in the process. What we’re asking for, and as leaders in our community, we’re aware of the impact that climate change is having on our environment and we are aware of the eminent threat that it poses to not just our food systems but our health and the health and wellbeing of the most vulnerable members in our community. And I really, actually, would like to thank Councillor Tapinos for sending me the definition the other day of the word emergency because what it does, the definition of the word emergency, is ‘a dangerous situation requiring immediate action’ and the synonyms of emergency are crisis, urgent situation and extremity. And, these are things that we are recognising, and we are seeing in our community right now. We have beaches down at the Great Ocean Road that are eroding week by week. We have bleaching of our Great Barrier Reef. We have bushfires in the middle of winter. We recognise that we’re having more and more intense heat waves, we’re having flooding. These things are happening to us and we are aware of it, we are aware that we are at an ecological tipping point and that we have a limited amount of time to act. Now, as council, we have taken quite a lot of action in this area and I acknowledge the work that we’ve already done in this space, and our ongoing partnership with the Moreland Energy Foundation, which enabled us to have our Zero Carbon Evolution Strategy. The other work that we have done, including the Urban Heat Island Effect, food systems, procurement, divestment, Watermap, Waste and Litter, Integrated Transport, Cooling Communities and Urban Forest Strategies, these are all steps that we are taking to mitigate the effects of what is a climate emergency. So, I really implore my fellow councillors here today to actually stand with us, and stand with Darebin, and stand with now a number of cities across the world that are recognising that we are at this point, we are at a climate emergency. I just would like to finish with the one quote that is actually written in our Zero Carbon Evolution plan, and that is from Ban Ki-moon, the former Secretary-General of the United Nations, and that is “we are the first generation to be able to end poverty and the last generation that can take the steps to avoid the worst impacts of climate change”. Cr Natalie Abboud: “Ah, thank you. So, this is not just a local problem, this is a problem for the whole planet. And the implications for each of us not doing anything is like when there’s a big demo at the city and you think to yourself, ‘ah, I might not go’, and then you remember that if you’re not the only person that decides not to go, nobody goes, and nothing gets done. So, I’d like to draw attention to something that really struck me, because I’m kind of concerned with how farming happens, which is that right now, probably tomorrow night, as hurricane Florence, which has been billed as the strongest storm to ever make land fill, land fall, with winds of up to 209 kilometres per hour, has caused over a million people and their mobile homes to be evacuated from the path of this storm. It’s caused the largest pig abattoir in the world to be evacuated and closed down – that employs four and half thousand people, so they’re not working today, they’re not. The pigs… last time a storm hit this area the dead pigs were floating down the river. This storm is expected to go over half a dozen nuclear power plants, it’s expected to drop 600 millimetres of rain over industrial waste sites, pits holding coal, ash and huge lagoons full of animal waste. If this is not an environmental emergency, then we probably haven’t grasped the idea of emergency at all. I wanted, I couldn’t come to terms with this at all, but this figure says two and a half thousand billion – which is how many cubic meters of ice have melted in the last 25 years, and half of that ice melted in the last 12 years. What’s happening is, storm surges are hitting the Antarctic where the floating ice is gone. They’re hitting the ice shelves and they’re fracturing the ice shelves, causing the glaciers to be able to reach the water quickly, which is resulting in sea rise. Cr Lambros Tapinos: “It’s the nature of the debate that’s occurring and it is frightening stuff and its quite scary stuff, and we should all be so concerned. But I wondered what are we actually doing about it, because it seems to me this motion not to have much substance at all. It’s a declaration, that’s all. At least our counterparts in Darebin actually have conference. So, I mean, if I’ve ever seen a feel-good motion in this chamber, this must certainly be one, where we can get up here and make this drastic declaration of emergency, the world is collapsing, but yet all that we are seeking for is a declaration. A declaration. Surely, Mr Mayor that this motion should at the very least be calling for an update of our municipal emergency management plan. Now, that is the management plan that we undertake emergency response to. Surely if all these things are a dire need in our city, we can effectively indicate through our emergency management plan that we need to take drastic action – inform ambulance, fire stations, local authorities, services and police. This is what the declaration of emergency will do. Cr Mark Riley: “After attending the conference today and with expecting our Spark Conference to happen next week, it’s quite evident we are doing things and this motion is intended to try and reframe the situation. And, obviously it brings out some passion in us and gets emotional reactions, and in fact we had psychologists for Safe Climate today talking to the conference about that and we had some excellent communications people talking about how we can frame that and how we can work with some of those issues. So, it’s inevitable that’s going to happen when you start to touch on these things. I think we are, we have got much of the foundations, we are doing this kind of work and we’re trying to reframe it a bit because we have the United Nations already saying to us that after two years of… since the Paris agreement, the United Nations own environmental program put it like this, ‘today we failed’. And, if you look at David Spratt, one of the other speakers today, he talked about the Paris text being a political fix. And, this is where some of the passion gets into it, because we’re actually, you look at all of the emission reduction commitments from all the voluntary national commitments that have been declared so far, we’re on a path to 3.4 degrees of warming when we know that Paris is meant to say that we’re getting to 2 or significantly under 2, and that would happen by 2100. That’s only a couple of generations away, we’re already, you know, nearly to 2020. And that, you know, more than 5 degrees is a high-end risk and includes carbon cycle feedbacks in, taken into account. So, it just kind of gets worse. And, as I said earlier tonight, really, we should be sticking to around about 0.5 degrees of warming as an ideal level of warming that humans and other species can live and thrive in. So, as much as this is a word or a title, and it’s a reframing, it is important to do that because I think the way that we communicate and engage with our own community is essential, and I’m not saying we aren’t doing it, I think we are, we’ve got a lot of leaders here. Some of them are in the room tonight, and many of them were in the room today at the Northcote town hall. And, when we put this up on the display board, it got an ovation from the audience. Cr Sue Bolton: “Well, in response to Councillor Tapinos, the, well, if this was all we were doing, changing a few words, then yeah sure, that wouldn’t make any difference. But, the intent of this is for action to go, to go hand in hand with signing this climate emergency declaration. And in fact, even beyond the impact on the climate and people and other living animals that have been mentioned by other people in the chamber so far, there’s also even the fact that can we afford, like financially, as a community, afford to deal with all of these disasters. You know, hurricanes beyond what we’ve experienced before, bush fires which are of a scale that we haven’t seen before, like, things are at a much higher scale, and there has been in media very little linking between these disasters and droughts and climate change. Cr Oscar Yildiz: “Yeah, yeah exactly. But, it’s self-explanatory. It is making a statement, but if we didn’t get up and do this tonight, I think we’d be doing us injustice, because as a council we reflect a lot of what’s in the motion to start with. So, I mean, I think councillor Martin mentioned the other councils, but we in particular are champions in this space. So, whether we make this statement or not, it’s just self-explanatory. Well, I don’t know why we need so much debate on something that makes us, that puts us on the map for the right reason. But also, it’s about our future generations. If we can’t start eating and breathing this and acknowledging this, in everything that we do, I don’t think we’re going to have a planet. The Climate Emergency motion at Moreland Council meeting follows on from the City of Darebin adopting a climate emergency plan at their Council meeting on 21 August 2017 and implementing a climate emergency framework as part of their Council Plan. Over two days on 11-12 September 2018, the Darebin City Council convened and facilitated a successful climate emergency conference at Northcote Town Hall. 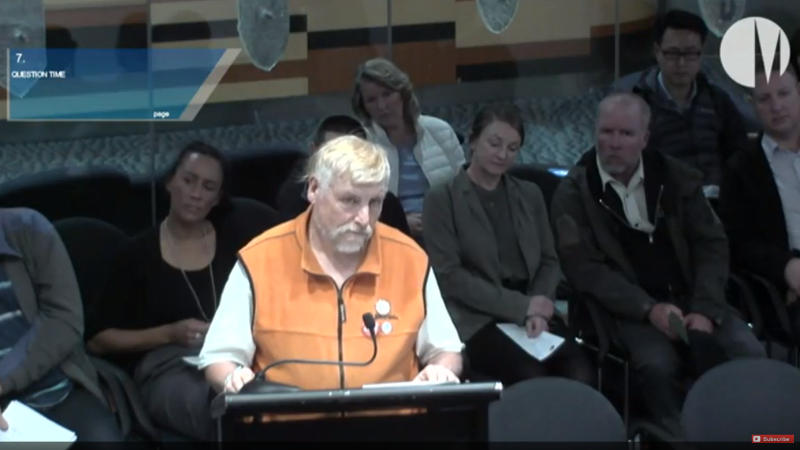 John Englart ask a question to Moreland Council at the council meeting at 33min 30sec. This entry was posted in news and tagged Australia, Local government, Moreland, video. Bookmark the permalink.